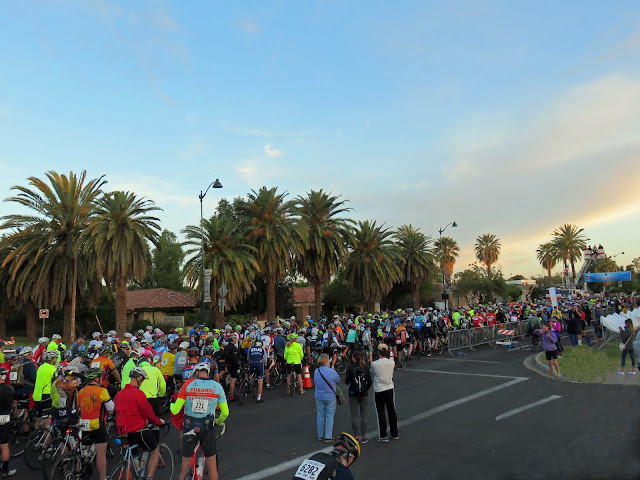 Today I'm riding in the El Tour de Mesa. I'm going to do the 100K (61 mile) ride. It should be a total blast! OK, people. Did you really buy that? ME, riding a bike for 61 miles?? Haven't you learned anything in all the years you've been reading The Rant? So, yeah, it's not me doing the riding, it's Ed. He did the El Tour de Tucson last November and decided (just two days ago) that he wanted to do this ride. So we scrambled when we got home from our run yesterday and shuttled our butts up to Mesa. I was up at 4:30 a.m. this morning to get ready and be at the start line with Ed by 6 a.m. There was quite a crowd, including Mesa's Mayor, John Giles, who kicked off the festivities. I can't wait to greet Ed from the sidelines at the end of 61 miles! !